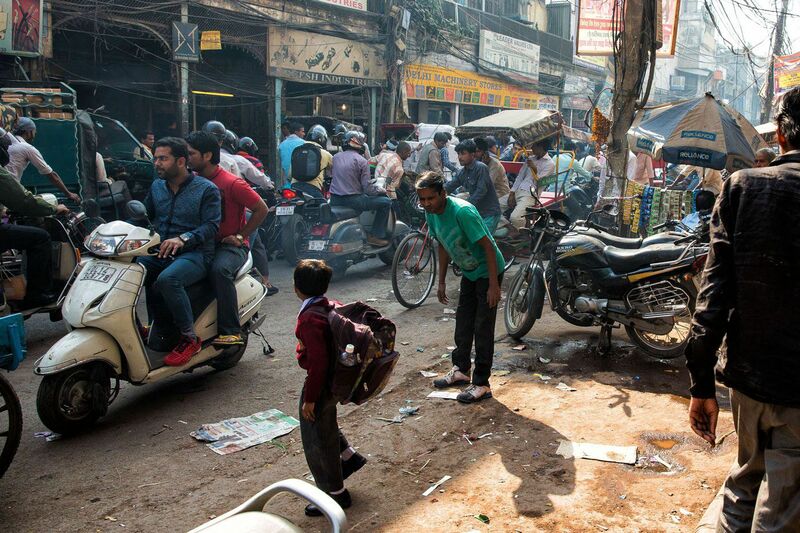 During our time in New Delhi, our visit to chaotic Old Delhi was a highlight. This is a crazy place, with the traffic, noise, congestion, and even the odd smells we encountered. 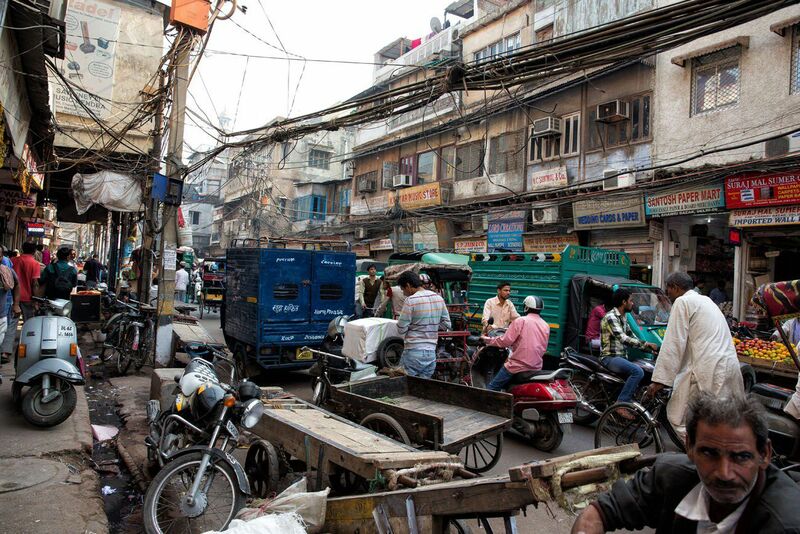 A walk through chaotic, Old Delhi is something to consider doing on your visit to India. 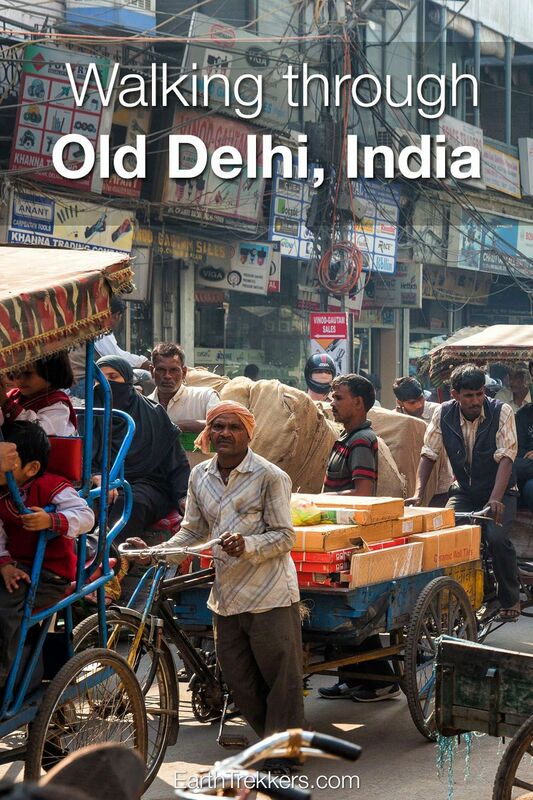 New Delhi, the capital of India, is a city we all really enjoyed. 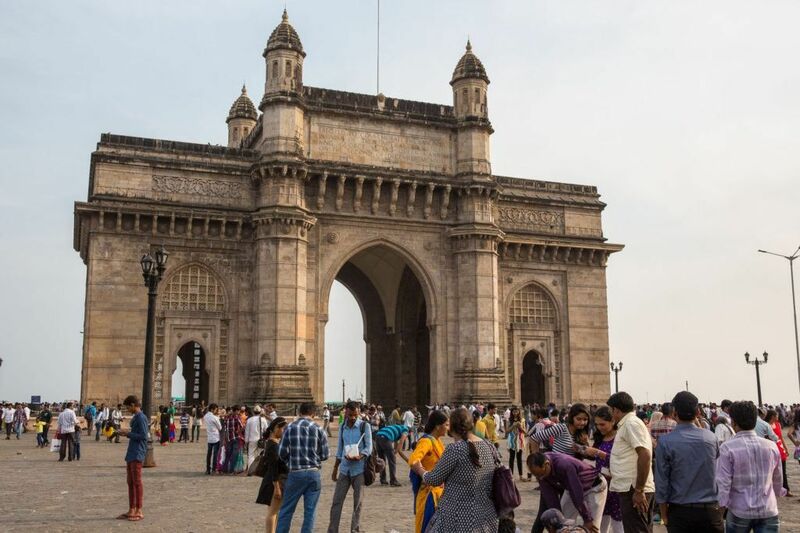 Most tour books and travel sites usually warn first time travelers to avoid this city because it can be so overwhelming. We totally disagree with this statement. 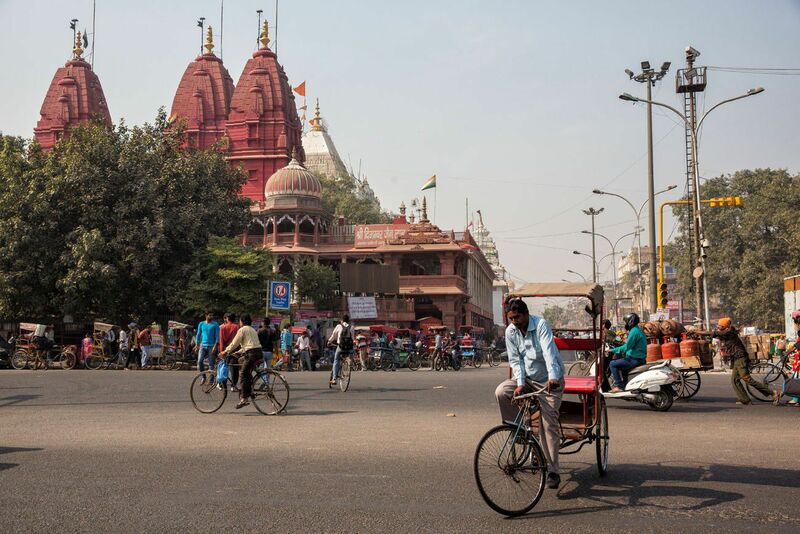 Yes, there are areas that are packed with people and are absolute mayhem, but compared to other Indian cities we found New Delhi to be cleaner, quieter, and a lot more modern. Here you can eat great authentic Indian food or find outstanding western restaurants. There are modern malls and even an amusement park. 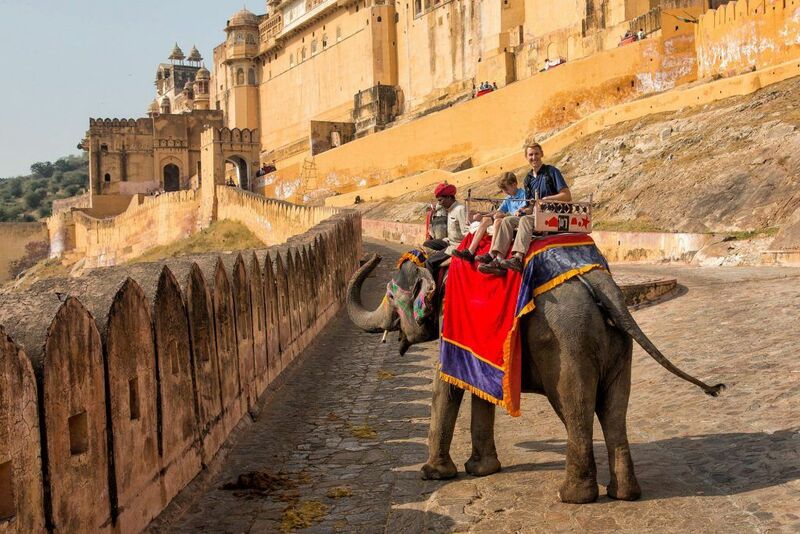 New Delhi also has its fair share of ancient ruins and landmarks and museums. There is plenty here for everyone. 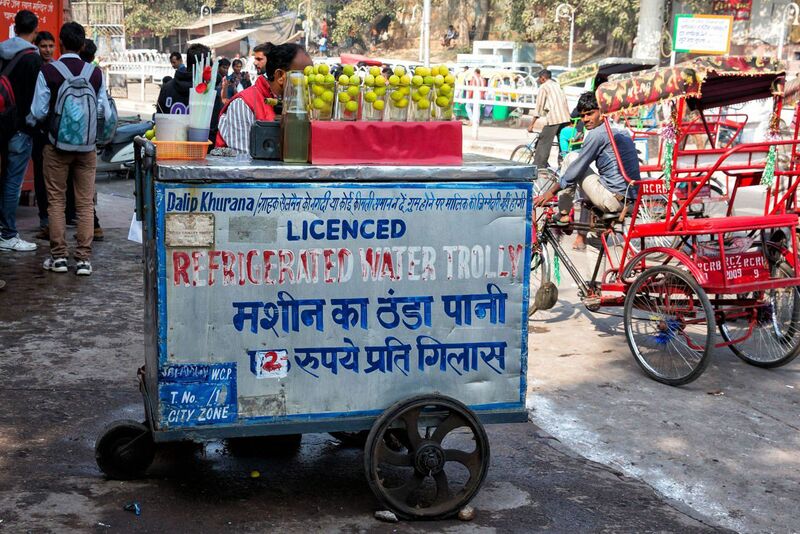 We spent a total of five days in New Delhi. Our stay was this long because we needed the time to get our visas for Myanmar. This process took three days and three visits to the embassy…getting visas are never easy or straightforward! We spent some time visiting the New Delhi landmarks but I will admit, we did go shopping in a mall and even spent a day at Adventure Island, New Delhi’s very small amusement park. We have found that when traveling for so long, it’s nice to do something fun, especially those things that remind you of home. Tyler and Kara were in desperate need to “just have fun,” and Adventure Island was the perfect escape for them. 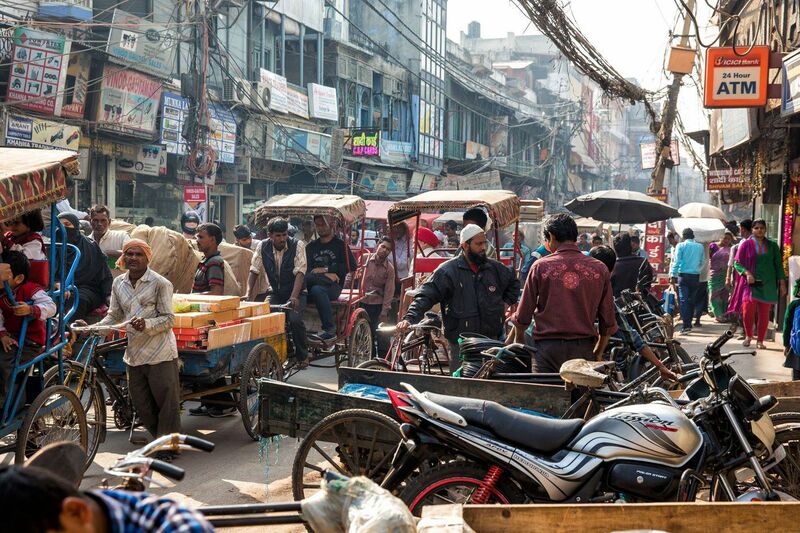 You can’t come to New Delhi without visiting “old Delhi.” This is the oldest area of Delhi, a tangle of ancient streets and alleyways, filled with all kinds of shops, jam packed with people, and this is the place to go for chaos and mayhem. Our family, fair skinned with blond hair (all but one of us! ), two adults and two children, one who carries a stuffed lion everywhere we go, are like exotic creatures in India. We are constantly attracting stares as we pass people on the streets. People constantly approach us for photos, sometimes politely asking us first and at other times “reverse” photo bombing us. We cannot visit a tourist site without attracting a large crowd of people. It was fun and entertaining three weeks ago in Mumbai but now it is exhausting. We have learned to keep moving; once we stop people flock towards us for those photos they want so badly. I am beginning to wonder how many Indian photo albums our family will be featured in. 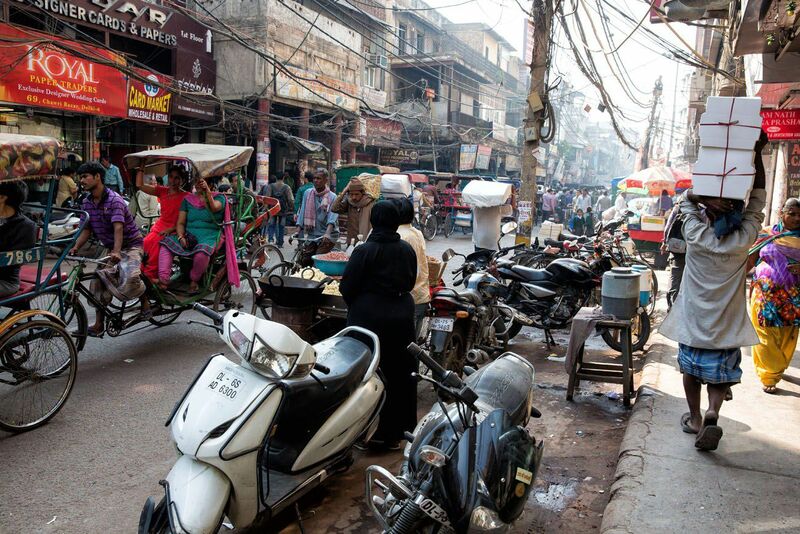 After visiting the Red Fort we walked down Chandni Chowk, the main thoroughfare through Old Delhi. This road is insane. It is a wide road, flanked with sidewalks on both sides of the streets. 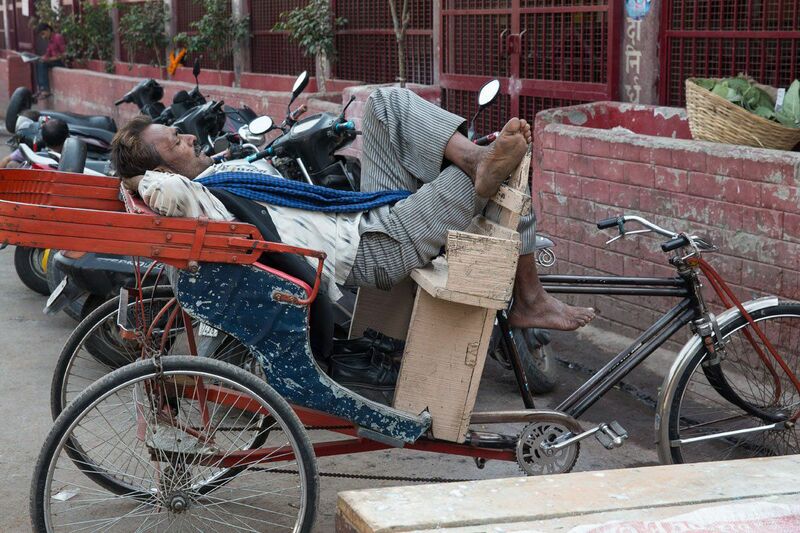 It is almost impossible to walk down the sidewalks in India (if they even exist). Shops and food carts spill out onto the sidewalk, people and cars park here, and when the roads really get crowded, it is not unusual for bikes and motorcycles to drive down the sidewalks. So we mostly walk in the street, as unsafe as that sounds. 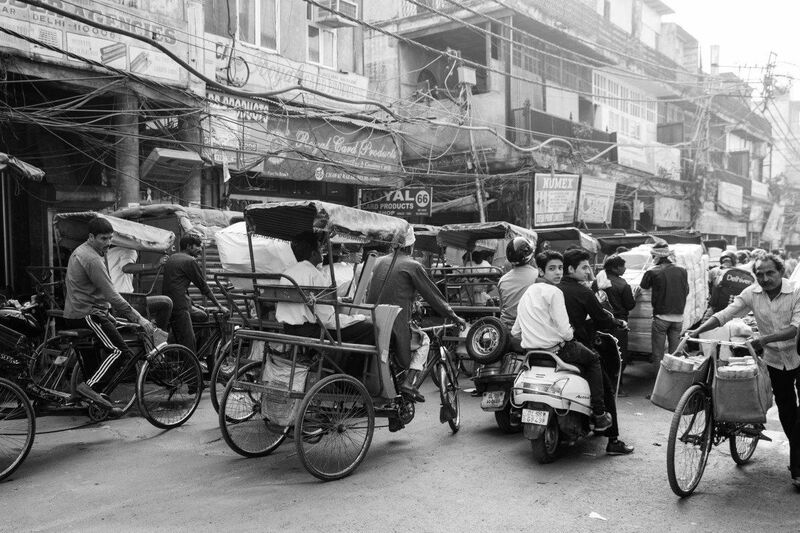 This is just as crazy, with motorbikes and tuk-tuks constantly blaring their horns, cycle rickshaw drivers insistently offering to take us somewhere “for a cheap price…just 50 rupees!,” and the occasional car or tuk-tuk traveling against traffic. Meanwhile, shopkeepers are trying to lure us into their stores and men on the street are trying to get us to visit their carpet store or silk factory. It is all very bamboozling. This is India. The people are also very friendly. 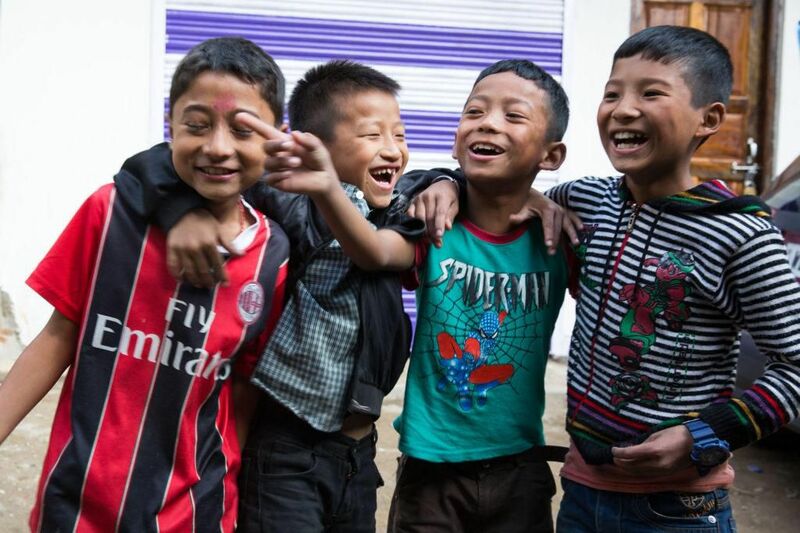 Kids love to wave to us and say hello. Adults like to strike up conversations with us, curious where we are from (most people think we are German). Other than the dangers from the roads, drinking water and illness, we have never felt unsafe here. Crime, at least in the cities we have visited, has not been an issue at all. 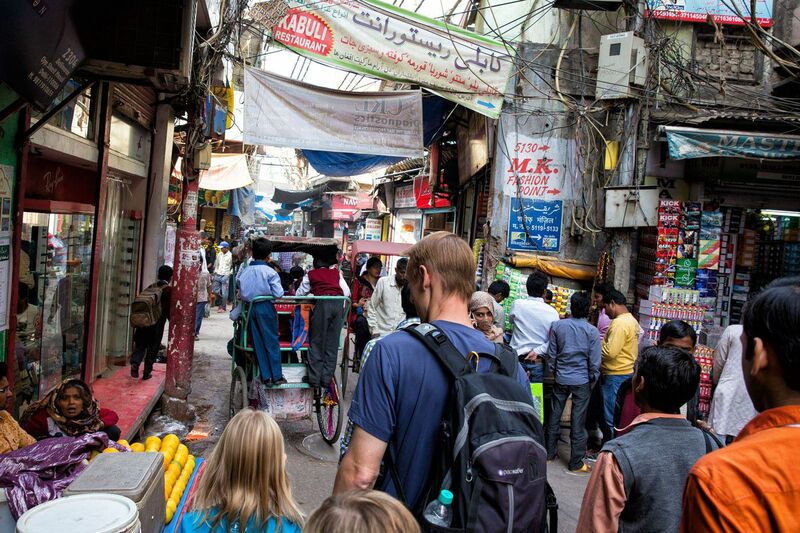 We wandered our way through the narrow alleyways of Old Delhi. We passed by shops selling jewelry, saris, cell phones, food, paper, books, clothing, shoes, toys, you name it. There was nothing of interest that we wanted to buy but it was fascinating walking through these tight, crowded alleyways. 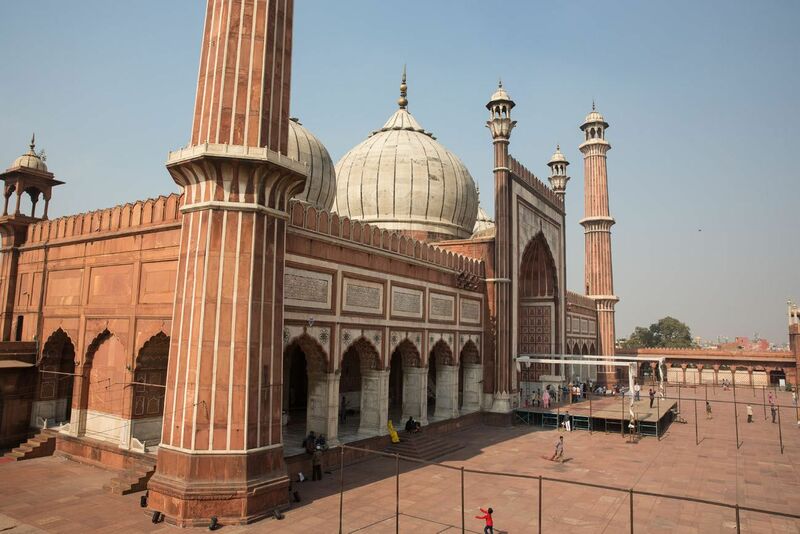 A visit to the Jama Masjid Mosque and its tower gave us slightly good views over Old Delhi. We sat on the steps and ate a snack as the muezzin played from one of its minarets. Again, curious locals gathered around us and not so discreetly took photos of us. 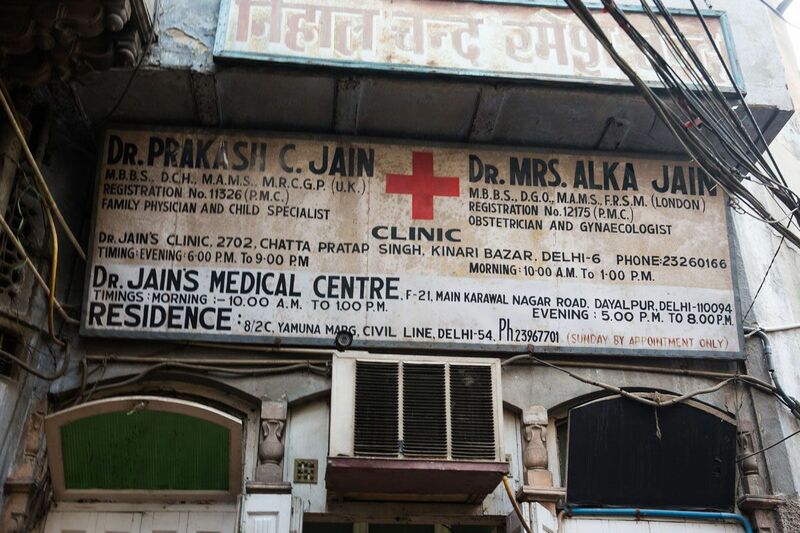 Our walk continued through Old Delhi. 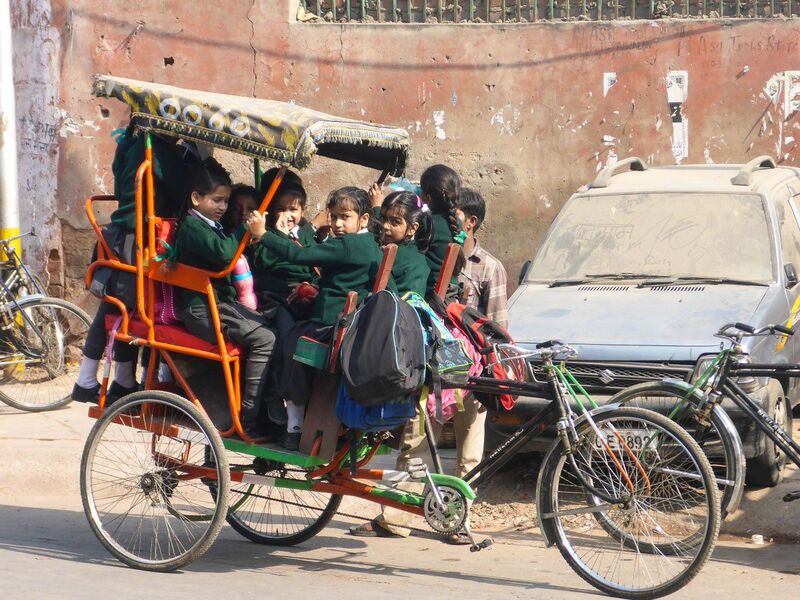 School had just let out and kids were taking cycle rickshaws home instead of school buses. Traffic in the streets was almost at a standstill. 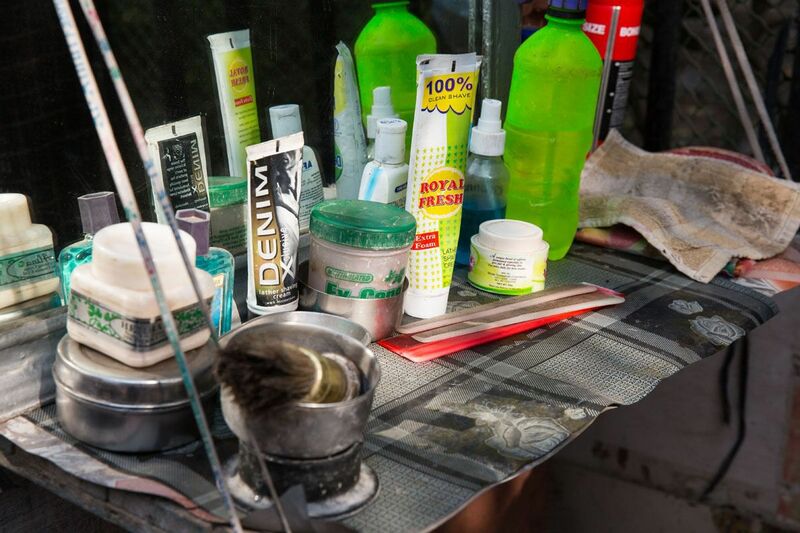 Would you get your Haircut on a Street Corner in India? It has been almost two months since Tim and Tyler had their haircut. 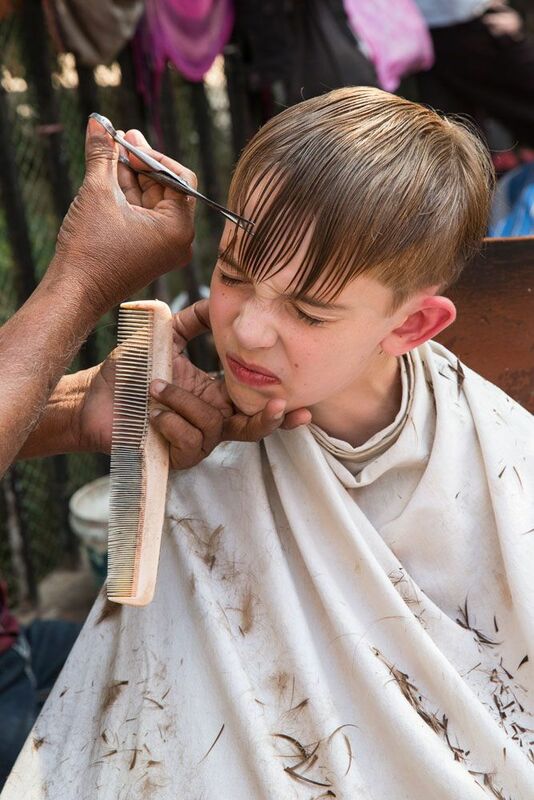 Tyler was dreading having his hair cut while in India. Tim looked at it like it was another adventure for us… and it was. 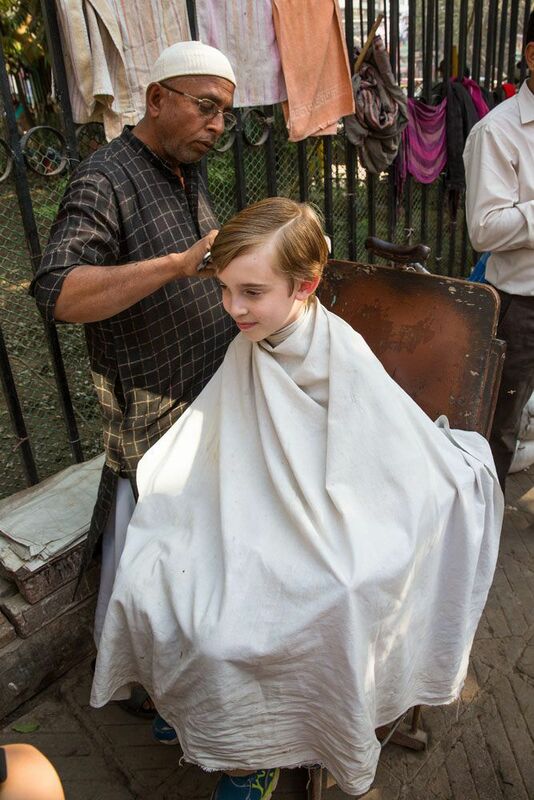 It just so happened that Tim noticed a barber chair on a street corner right on Chandni Chowk. 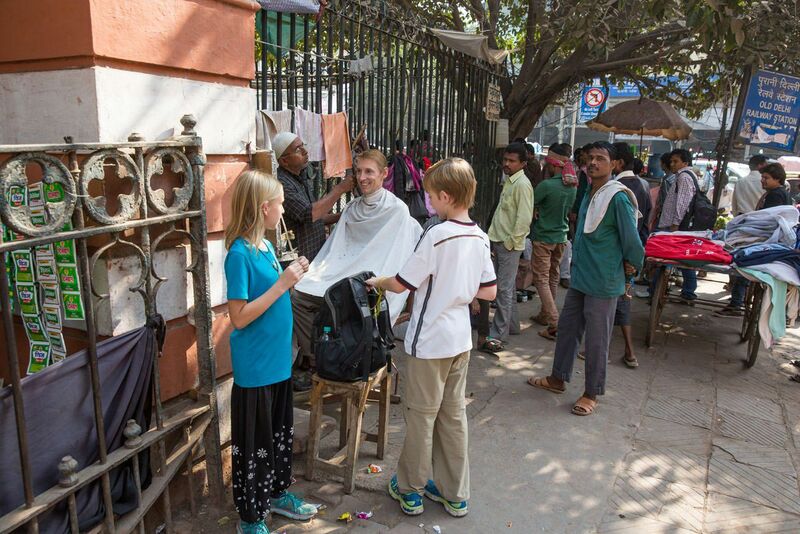 What better place to get your hair cut in India…on one of its craziest street corners on one of its craziest streets. We looked at the barber’s comb and scissors. They were dirty and ancient looking so Tim had some second thoughts. Still, he hopped right into the barber’s chair. Tim definitely attracted a crowd. The kids and I watched as Tim’s hair was cut. People passing by would stop and watch for a few minutes and then move on. The barber did a very nice job, a big surprise! I don’t know why but both Tim and I thought he’d get some terrible hair cut here! Next, it was reluctant Tyler’s turn. He climbed into the chair and the barber went to work. Just like Tim, Tyler got a very nice haircut. Now we are all wondering if Tim and Tyler will get lice. To be on the safe side, we have been using separate combs and pillows. I think it will be a miracle if we can get through this trip without someone getting lice or bed bugs (you may be interested in reading Worst Travel Moments while Going Around the World)! 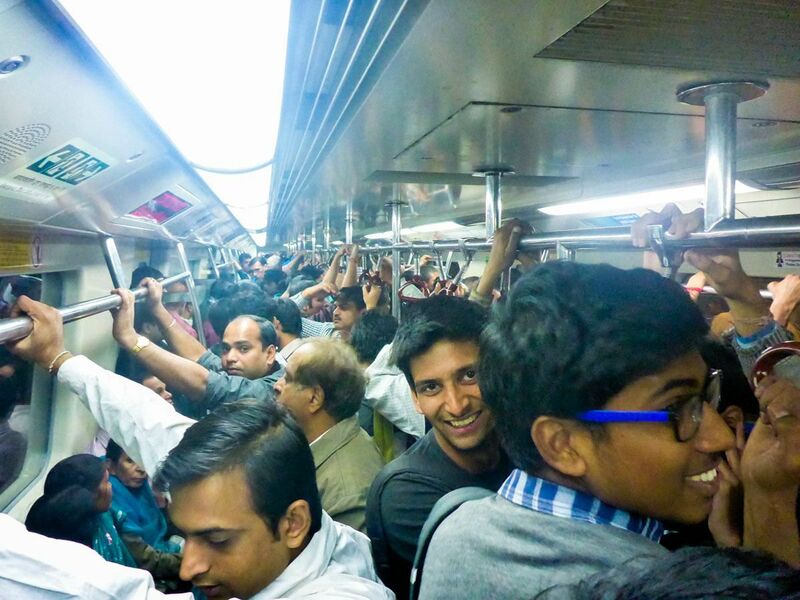 To get back to our hotel, which was located in much quieter South Delhi, we rode the Delhi Metro for the first time. Like most other things, we were expecting hot, run down, slow metro trains but we were very pleasantly surprised. The metro system and its trains were very modern and relatively clean. But it was approaching rush hour and it would be a very crowded ride. The train approached and it was already packed with people. Our group pushed our way on board, filling every space available. Just when we thought it couldn’t get any more crowded, we’d pull up to another station and more people wedged their way in. All of our bodies were pressed together, and poor Tyler and Kara, with their shorter heights, were staring into the chests and backs of these people. Kara absolutely hates crowded metro rides…I think it’s her least favorite thing in the world. As we got closer to our station, the crowd eased up a little, but this was still the most crowded metro ride we have experienced. 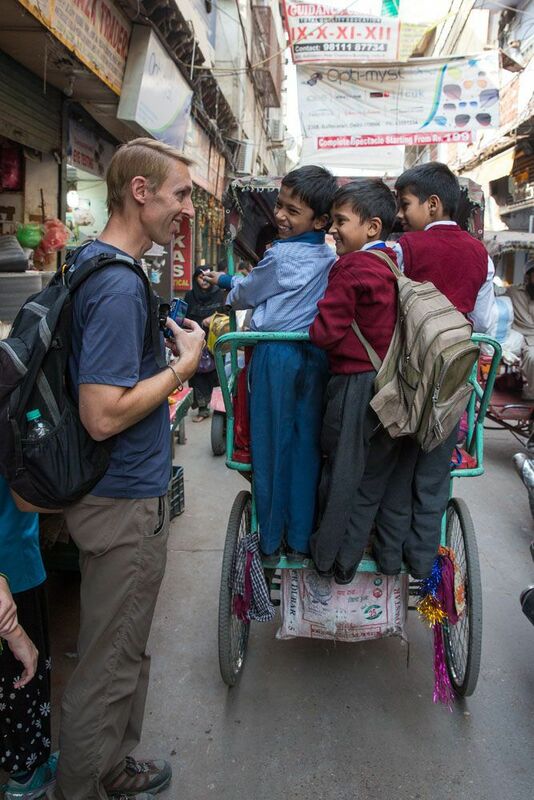 New Delhi was a great stop on our itinerary. We had plenty of downtime, got our visas, did some sightseeing and shopping, and visited the amusement park. It was not nearly as intimidating or overwhelming as people say, but we did have four weeks of India under our belt so were very familiar with how things work here. Now begins our last week in India. Next we fly to Varanasi, India’s holiest city. I am expecting things to get harder but also much more fascinating. This is such a lovely article! 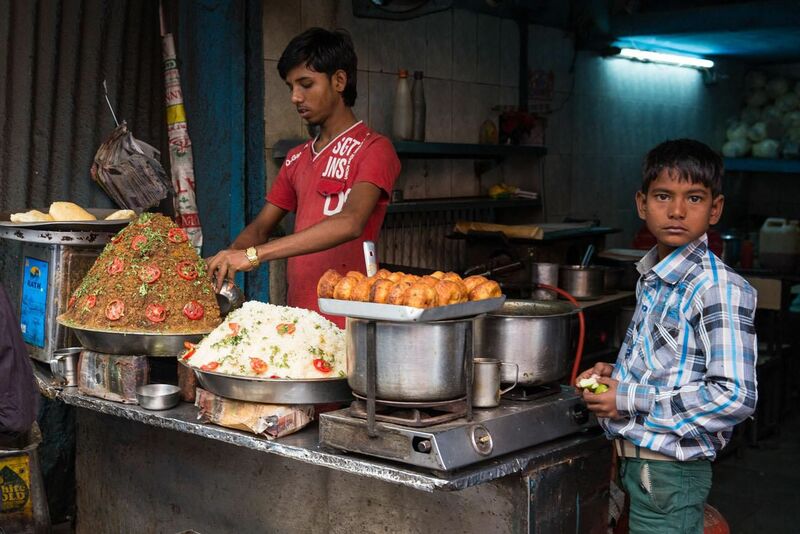 Thank you so much… visiting Old Delhi this week just for the afternoon and feel very inspired by your blog with all your wonderful photographs! 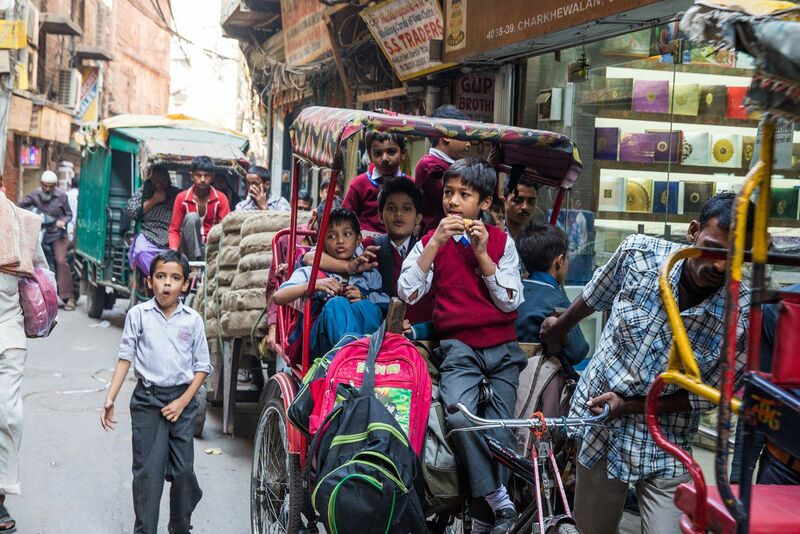 Loved reading the awesome places of Old Delhi. it is very frustrating to read such blogs and then to see the reality..
You pictures are facinateing, I love them and your descriptions. The crowds look overwhelming. Where are spending Thanksgiving? We will miss you all very much. We will be in Calcutta, India. No turkey here. It is our last night in India so we will go to a nice restaurant for what will hopefully be a fabulous Indian dinner. We will really miss being with everyone on Thanksgiving!! Happy Thanksgiving!